In this second part of our feature on perennials, we'll focus on proper planting techniques and fertilization/spraying! Because of moisture and/or heat constraints in the south, perennials like these are often treated as annuals and planted each year. In some areas of the south perennials are planted during the late summer or fall, burst out in growth the following spring and then may die off during the excessively hot, dry summertime conditions. But because of how attractive these plants are, they will be planted again the following fall. Planting perennial clover is as easy as preparing a decent seedbed and broadcasting the seed at the appropriate rate. The seed should not be covered any more than ¼ of an inch. The ultimate would be if you could go over the broadcasted seed with a cultipacker or roller to ensure good seed-to-soil contact. Perennials should be planted in the spring in the north, in the spring or early summer midway throughout the country and during the early fall in the south. These planting times ensure the best survival for the crop since perennial clovers need 45-60 days to establish a root system, so they will indeed be perennial for you and return after dormancy. How often and how low you mow can greatly influence clover production and turkey utilization. Frequent mowing during the spring favors white clover growth. Besides how often you mow, another aspect of white clover maintenance is how much of the plant’s height is removed during mowing. Some absentee land owners or people that simply don’t have the time, do not mow often enough - and when they do, because they are “there now and can do it,” tend to mow too short at the wrong time. Infrequent mowing during the spring will allow the development of larger leaves. However, this results in less stolon production, fewer daughter plants and the loss of new growth. More frequent mowing, but not removing as much of the plant each time, will restrict total plant height, but enhances stolon survival and increases the stem density per acre. More frequent mowing typically equals a thicker, healthier stand that is more appealing to your flock. 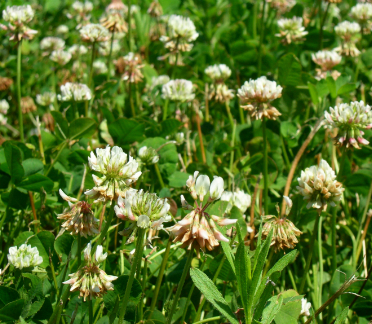 In hot or dry conditions, white clovers should not be mowed frequently and in some cases should even be left un-mowed long enough to produce seed heads. On my home property in Minnesota I typically mow frequently in May, June and into early July and then I watch it closely and mow when I feel that the crop can handle the stress. In July and August I also do not mow as short as I tend to in the spring and early summer. During the hot, dry months I use the “rule of thirds.” I never mow any more than 1/3 the height of the plants. With a perennial white clover blend, a good stand can be encouraged both, by frequent mowing during the spring to increase stolon production and survival, and no mowing during droughts or when the clover is growing slow to promote seed production. The use of herbicides is also recommended to help keep the unwanted competition out of your perennial plots. I typically treat with a grass-specific herbicide two or three times during the growing season. I tend to use a clethodim based herbicide more often than other grass herbicides, but there are many others that are also acceptable to use. Mowing tends to keep unwanted broadleaf weeds out of my plots, but there are also some options for herbicides to treat broadleaf weeds. One last suggestion is to over-seed your perennial plots every-other or every-third spring (or fall in the south). I typically over-seed at a rate of about ¼ of what I would do if I were originally planting the plot. This helps fill in gopher mounds, wheel ruts, spots where mowed plant matter has covered up and killed plants or bare spots created by other means. It also adds new, young seedlings to the plot. BioLogic usually claims three to five years growth on our perennials, but I have plots that are going on eight to ten years that look every bit as good as they did in their second and third year. With proper maintenance, combined with over-seeding, you can get longevity out of your perennials also. For more infomation on Biologic seed, including their Clover Plus, Perfect Plot, and Sudden Impact perennial blends, visit www.plantbiologic.com!